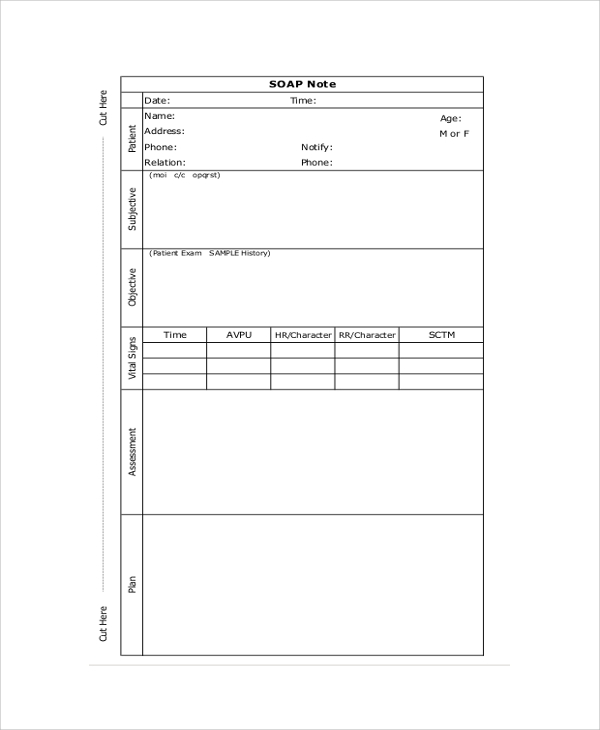 Sample SOAP notes are known as a documentation method used by the health care representative like doctors and nurses for creating a chart about health details of patients. 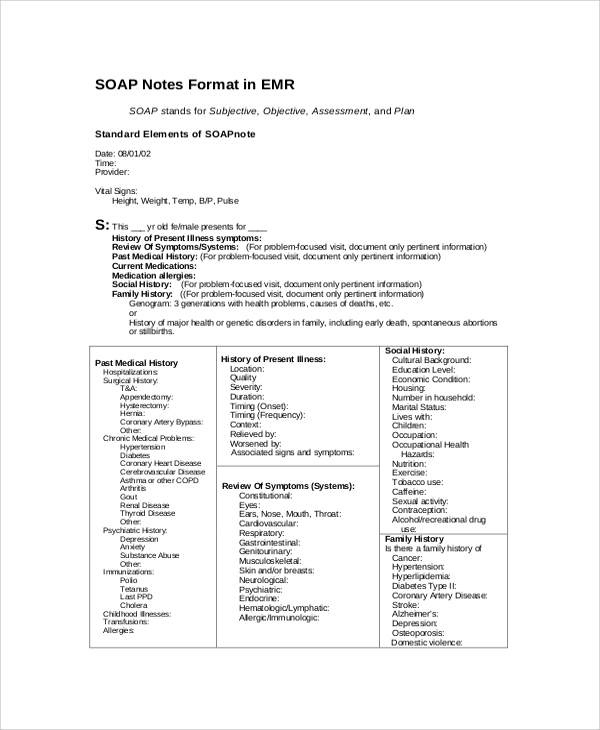 The word SOAP stands for four parts of Nurses and Doctors Note Sample – Subjective, Objective, Assessment, and Plan. 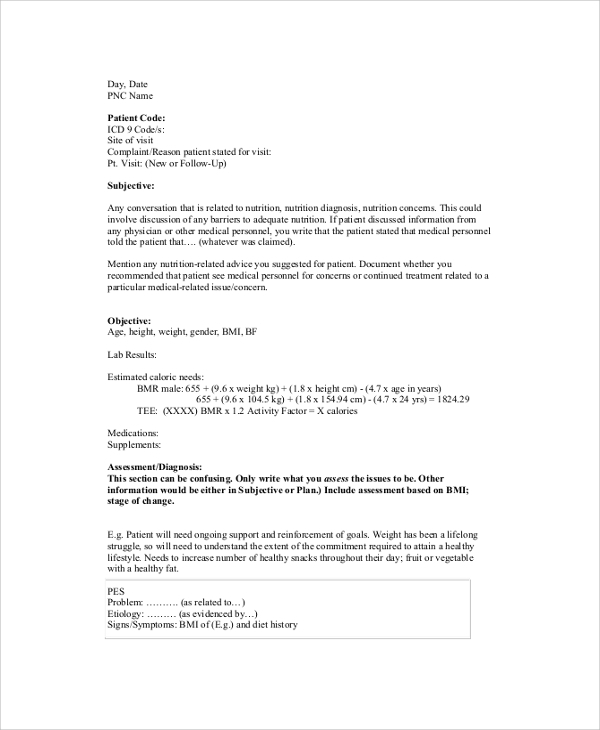 The below mentioned SOAP note examples possess the best format for preparing details about the patient’s health in a systematic order. The formats are also editable completely allowing you to enter details you missed out anytime. 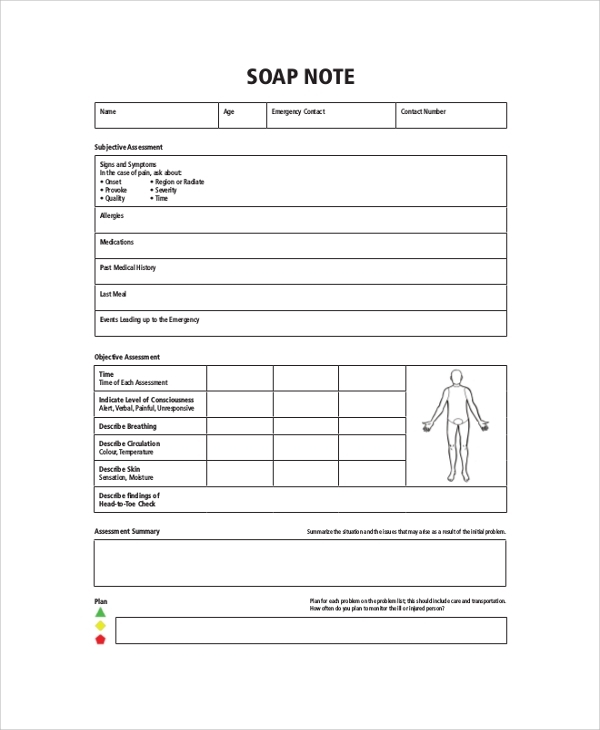 These SOAP notes are used by the physical therapists or psychotherapists for recording vital information regarding their patient and the proposed treatment measure. As the name suggests, this SOAP note is used by nurses. They first examine the patient and jots down all the problems identified in this type of SOAP note. These notes come with a simple preface. 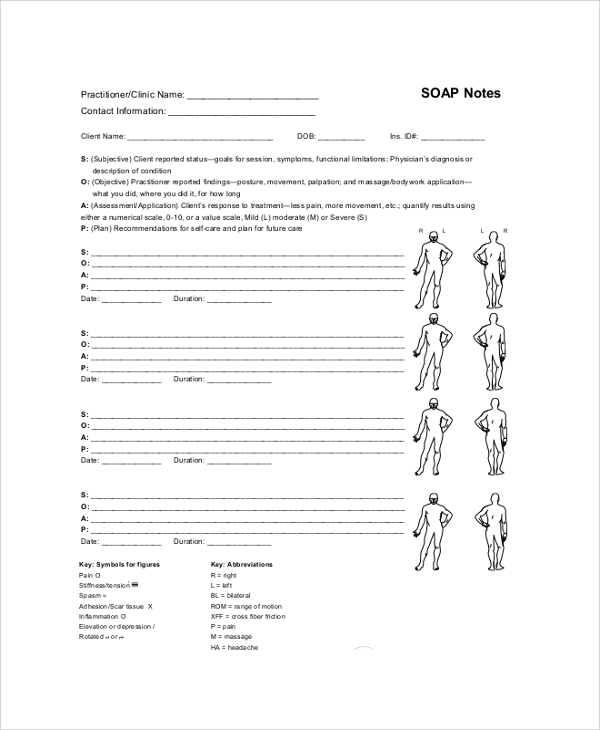 This SOAP note example is designed specifically for massage therapists who identify and help you to get rid of your body pain. They are simple but enticing to look as they come with figures on which therapist marks the area and the treatment proposed for solving the same. These notes as used as patient’s admission note as well recording the medical history and treatment measures. The format consists of the following heads- subjective, objective, assessment and plans. 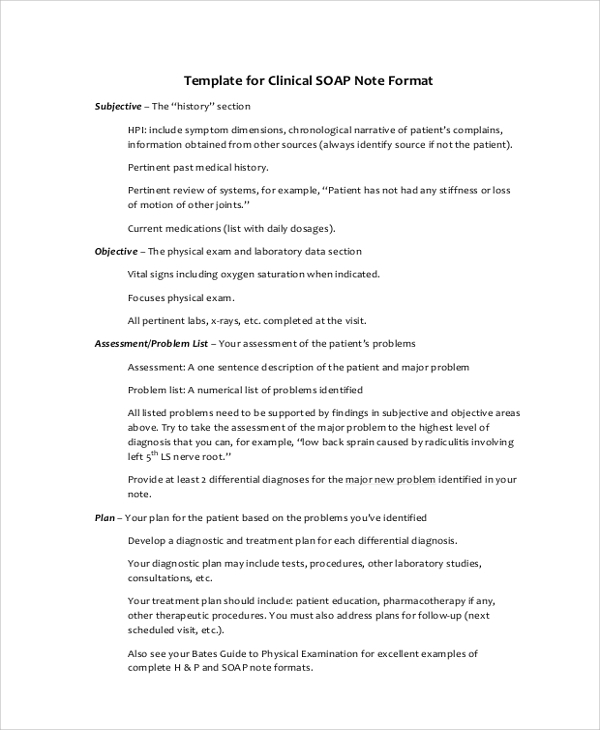 When you have to write down your observation about patients while having them around in the clinic, the best SOAP note you can make use of is the clinical SOAP note. 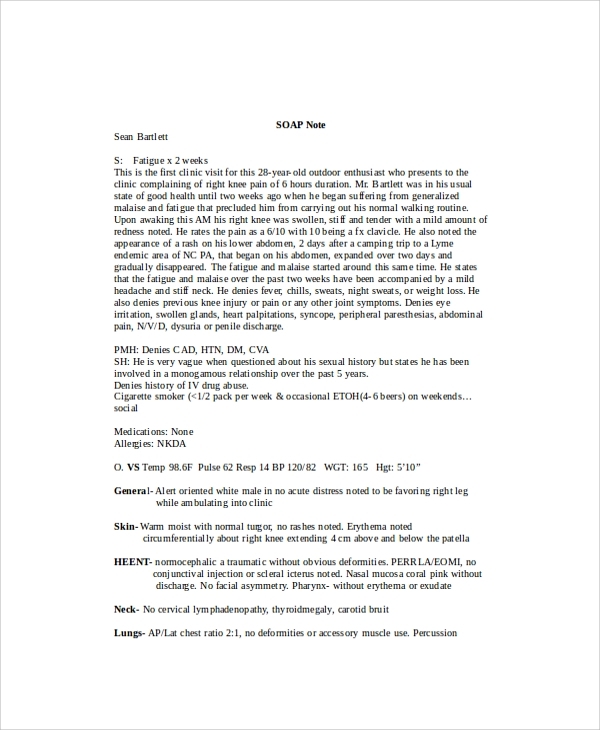 The Soap Note Examples are used widely by medical professionals such as doctors and nurses for listing down all their findings regarding the health condition of their patients. Not much technical skills are required in writing these since writing instructions are given within the note itself. These formats are editable allowing you to insert information and edit them whenever needed. With these, you enjoy writing your observations in different letterheads. Doctors and nurses encounter different patients in a single day. Keeping details about their diagnosis without jotting them down somewhere is not just difficult, rather impossible. This problem has been eased by the SOAP notes. 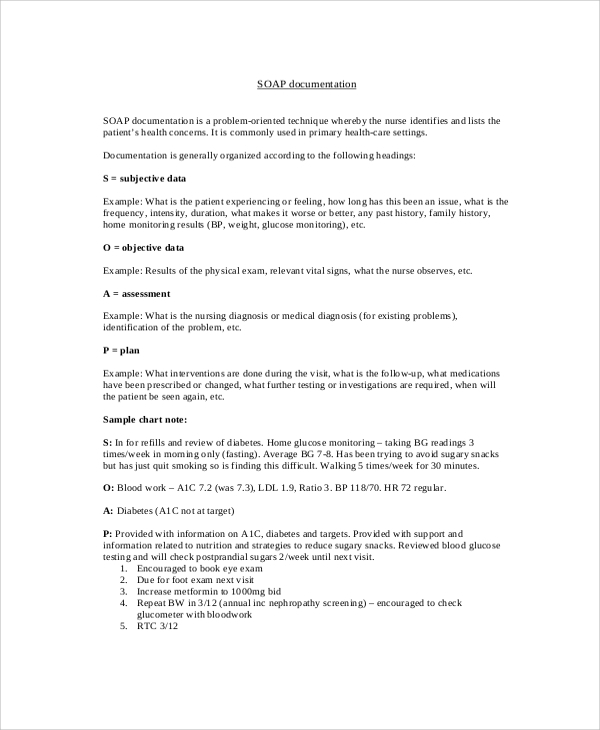 Using these, you can systematically record every minute detail about the diagnosis under the heads- subjective and objective as well as prepare plans about the treatment and jot them down under the heads-assessment and plan. These SOAP note samples listed above are highly in use by medical practitioners today. They come in appealing formats helping you to part away with the boring prescriptions. Using these will also help patients to understand their problem reading them once. Also, along with the SOAP note, you can get a thank you note printed too for the patients to make the therapy mood comfortable. So, do not forget to check for different Sample Thank You Notes along with the sample SOAP notes.